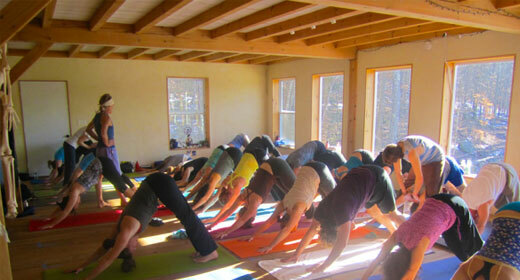 Bethel Farm is a small yoga and living arts center in the woods of Hillsborough, NH. We offer an atmosphere conducive to deep inner reflection and self sadhana. For years we have been cultivating the mood of yoga, of healing and peace that strikes guests instantly when they first arrive. The mood is enhanced by the gardens, that supply much of the produce in season for our meals. Our main yoga studio, with its warm textures and many windows, feels right for any size group, accommodating up to 40 yogis on their unfurled mats, or over 100 seated on cushions for a candle lit kirtan. We also offer simple accommodations and excellent vegetarian meals.